This is the second of my tutorials created as part of my contribution to mentoring teams of school children in an IT challenge here in New Zealand – see earlier article for details of that. These notes were prepared in answer to a question from a student “How do you make something happen when a sprite collides with a barrier”. The following describes one way you can detect when one sprite hits a barrier. Colliding with the edge of the screen (or, more accurately, the edge of the canvas that the sprite moves across). These notes describe the first case – the second one is really easy. By the way, “collision detection” is fundamental to pretty much any computer game, and understanding the basics of it is really useful. This article is from some notes I made when helping out as a mentor for a schools IT challenge – see recent posts for more details. A common problem the pupils had was that they would create their pages in an arbitrary order driven by their individual learning processes. After developing their app further at some point they would want to reorder these screens so that a specific one would appear as the start screen when the app runs. It turns out setting this in AppInventor is surprisingly difficult and is certainly not obvious. My solution below may not be the best, and is more of a workaround to what is probably just a current limitation of AppInventor. If future updates make this better, I will update this post. When you run your app, which screen appears first depends on how the app is run. The second circumstance is when you run the app from the phone’s (or emulator’s) home screen. In this case, the app always starts with the first screen in the list. Create a new screen. Let’s call this ScreenX. Copy all the controls and blocks from Screen1 to ScreenX. If the second screen in the list is now the one you want to be the first, select Screen1 and choose “Remove Screen”. This will move the desired second screen be the first one. Delete all the controls and blocks from Screen1. Copy everything out of ScreenY into the now empty Screen1. Copying between screens is unfortunately a manual process. 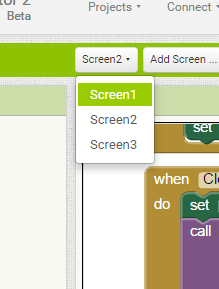 It might be easier if you have two computers side by side with the same project loaded into AppInventor, and refer to the original while making changes. This may work better if you make a safe copy of the original project and use this for reference. 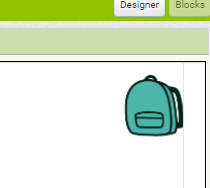 You can then switch to your destination screen, and when you click on the backpack again a copy of the block will be displayed, and you can move it out of the backpack. I will keep looking for a better solution. It could be for demonstration purposes you can ignore the start screen issue by running the demo from AppInventor using the emulator, and just ensuring you have your preferred screen selected as described above. Finally, as a general bit of advice, I would suggest using meaningful names for a screen when you first create it. E.g. “StartupScreen”, “LoginScreen”, “QuizScreen1” etc. This will help you when editing different screens as you won’t need to remember that “Screen2” is for one thing. “Screen5” for another etc. It may also help you if you ever need to merge two projects together as there is less likelyhood of a name clash which will prevent the merge. Merging projects will be a topic for a later note. As described in my previous post here, I have been involved in a schools mentoring programme to help expose kids to software development. The New Zealand Techhub Schools IT Challenge started last year in Wellington, and this year has rolled out on a larger scale across the major population centres of the country. The 2015 winners went on to create a shipping mobile phone app with the help of my employer, Datacom. I was fortunate enough to lead that development team, where we took the core ideas of the winning team, and with their help created a brand new application in just a few weeks. See earlier article for links to both the iPhone and Android versions. this was an investment by the company in people and resources worth tens of thousands of dollars. The team got a lot out of it personally, and genuinely got a buzz out of teaching the three girls about software product development and programming. It was satisfying for everybody to take some raw ideas and turn them into shipping code. A word about the winners. From St Mary’s College for girls in Wellington, for the competition they had to start from nothing, come up with some ideas, and implement what they could using MIT’s AppInventor – more on that later. Other schools in the competition had boys teams, and the stereotypical expectation might be that the boys would win given the much higher proportion of males in the IT workforce. So it was very pleasing to see the girls not only being right up there with the boys teams, but grabbing the prize too. All of the above is a bit of a long winded introduction to the point of this post. The choice of tools the competitors used was down to the individual schools. The organisers recommended a number of alternatives, but did not dictate any specific platform or technology. One of the options was MIT’s AppInventor. Originally created by Google, the Massachusetts Institute of Technology now maintain and promote it as an educational programming tool to create Android based mobile applications. The school I was mentoring at, St Mary’s College, decided that all teams from that school must use it. For me to be most help, I decided I really ought to learn it too. I am an experienced developer, and always up for learning new stuff. I have done some iOS programming, but Objective C or Swift and full IDE is a different kettle of fish to a web based graphical programming tool. So I spent some time doing various online tutorials, and this armed me to help answer questions from my teams. But I would sometimes get questions from the pupils that couldn’t be answered immediately, or required more time and careful explanation than was available in the classroom. They were interesting real-world problems encountered outside the realms of existing online tutorials. I ended up answering these by preparing after class, and then writing something up. Over the next few weeks I intend to publish these notes and targeted AppInventor tutorials in the hope that they will be useful for others. This is an event handler for a sprite object called Ball1, which gets invoked if the sprite hits any edge of the display area. If it does, it calls a built in method of the sprite that makes it bounce of the edge, and then sets the colour of the ball to a random one chosen from a predefined list. All of these blocks are presented in graphical palettes that the user just drags and drops into their work area. Very slick. To see your code running, you can launch an Android emulator on your PC or Mac. AppInventor connects to this, loads the code and executes it. Alternatively, you can also connect an Android device via USB or wireless, and the program will be loaded and run from there. The beauty of AppInventor is that it provides instant gratification. In other words, it is incredibly easy to set something up, write a bit of code, and quickly execute it to see if it does what you expect. As you make changes, they are dynamically uploaded to the emulator, providing a quick feedback loop that is essential to keep young inquiring minds engaged. I won’t go into more detail on AppInventor here as that can be picked up from existing online resources and my forthcoming notes. Give it a go and play! Last year I became involved in a schools IT challenge here in Wellington as a mentor for a pilot program run jointly by the Royal Society and the New Zealand Institute of IT Professionals. The aim was to challenge teams of year 9 and 10 pupils from a few schools in Wellington to create an app. It was to be a full-cycle development, taking in initial design, coding, testing, and finally demonstrations in front of a Dragons Den style panel who chose the eventual winner. Around 40 teams took part, each of up to four pupils, with the brief to create a school time tabling app. I was one of several IT professionals from various companies in Wellington who volunteered to be mentors to one or more teams. In my case it was two from St Mary’s College. It entailed advising on all aspects of the project, and providing technical input where appropriate – and without doing the work for them. The challenge took place over several weeks. Mentors visited the classes as often as needed, and were also available to provide support via email. Personally I found the whole experience very rewarding, and it was great to have a chance to introduce the next generation to various aspects of IT as a profession. The programme is rolling out on a more nationwide scale over the coming years, and I would encourage anyone to put their hands up as mentors. The prize on offer for the winners was donated by my employer, Datacom, to provide resources to develop the winning idea into a shipping application. The call went out around the company asking for volunteers to join a small engineering team which I ended up leading. The winning pupils coincidentally came from the same school where I was mentoring, although they were being guided by a different mentor (also a Datacom employee), and called themselves the Pastel Programmers. An initial launch and brainstorming workshop was held at the end of September with the three St Mary’s pupils. 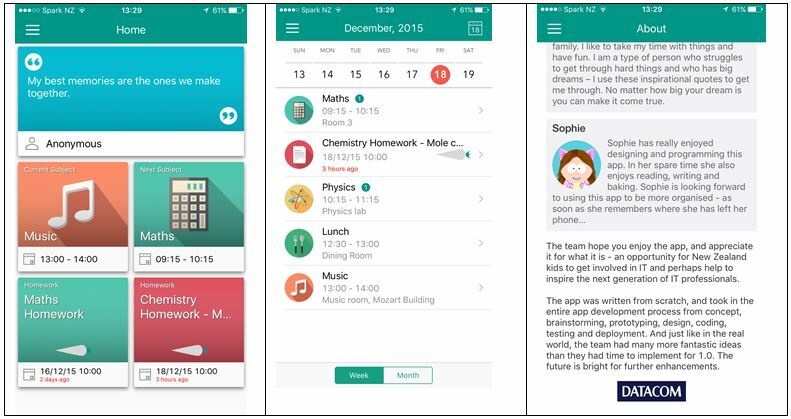 This set down the core design principles and ideas behind what became a school timetabling app called Pastel Planner. The team quickly created a mockup using Flinto, and shortly afterwards the shell of the app was created on both Android and iOS platforms. Through October and November the app evolved with continuous feedback from weekly workshops with the Pastel Programmers. They contributed ideas, artwork and assets, and also took part in some pair programming with the Datacom developers – something they said was perhaps the highlight of the whole experience. Pastel Planner lets a student manage their timetable, subjects, and homework in one central location. Camera integration makes is easy to grab homework details from the whiteboard. By the end of the exercise we had created a functional and useful app, which also incorporated a few fun ideas. But more importantly, the students were exposed to and involved with the full cycle of product development, and will have picked up skills and knowledge that they can apply to any team project. I took this while on a weekend trip to Lake Taupo in New Zealand. 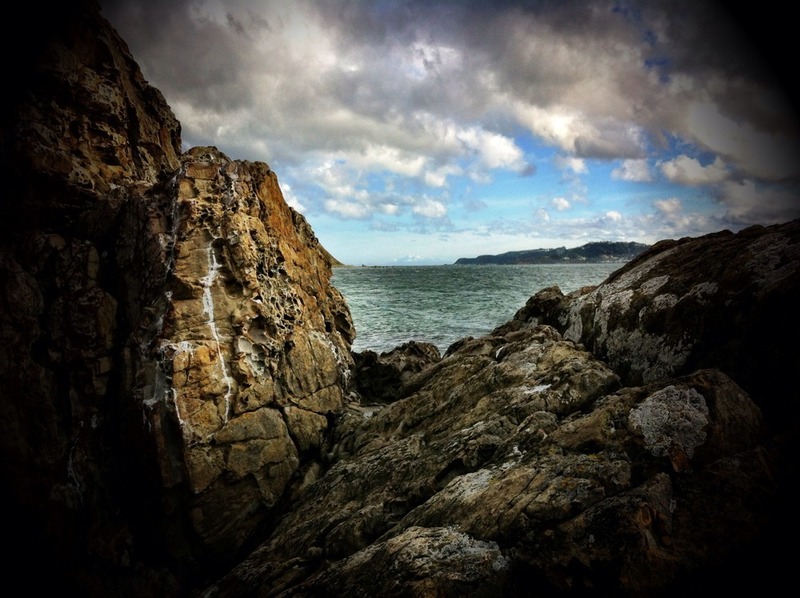 A view across the Cook Strait from Eastbourne near Wellington on the North Island. You can just about make out the snow capped mountains of South Island. Photo taken on iPhone using Camera+ app. One day I will go back with my DSLR and get a load more photos of this quite stunning area.